The Sealinks Project workshop “East Africa in the Indian Ocean II”, held in Oxford 22-23 March 2012, has been reviewed in a recent story in the African archaeology journal Azania (2012, Volume 47(2), pages 226-30). The piece, by Professor Peter Mitchell of Oxford University, describes it as “a highly productive as well as convivial workshop, conducted in an open an interdisciplinary spirit that augurs well for further research”. The workshop featured 23 papers across a range of disciplines, including archaeology, genetics, linguistics and palaeoenvironmental studies. 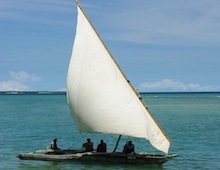 It followed on from an earlier workshop, “East African in the Indian Ocean”, held in York in 2009.